Spare parts are available for virtually any machine ever invented. So why not the human body? San Diegobased companies Invetech and Organovo have developed what amounts to a dot-matrix printer for human organs. The device, small enough to fit into a sterile biosafety cabinet, consists of two printheads  one that sprays out a gel that forms a sort of armature for an organ and another that fills in that scaffolding with living cells. 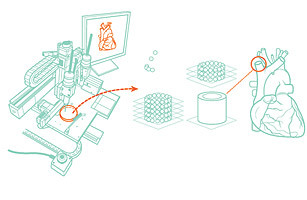 The printing tip positions cells with a precision within microns. Livers, kidneys and other replacement components  including teeth  could be built on demand, with no wait for a donor and less risk of rejection, since the cells are harvested straight from the patient. No word yet on a parts-and-labor warranty.